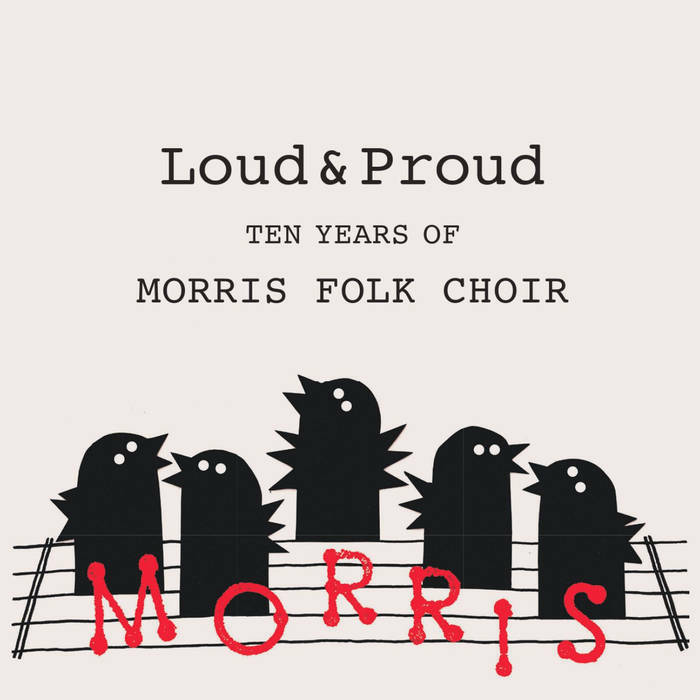 Loud and Proud: Ten Years of Morris Folk Choir. An album recorded to mark our 10th Anniversary. Digital album and CD available from Bandcamp. CD package designed by Jen Charon; Singing birds artwork by Elsbeth van der Poel; Choir photo by Rosie Barnes Sleeve notes by Fiona Clark. Here is a Youtube clip of Dolores Keane and John Faulkner performing their version of this with The Chieftains. The Haradala/Dance to your shadow sections are from a song collected and anglicised in Marjory Kennedy-Fraser's Songs Of The Hebrides Vol III, and the Tunes in the river section from a song collected and printed around the same time (according to this thread on the Mudcat folk lyrics and knowledge site). The Yenamanoa section is based on the puirt a beul called Fionnghuala; here are the Gaelic words for that, with an English translation, and there are several old field recordings on the excellent Tobar an Dualchais site. For more on puirt a beul, here are articles on Wikipedia and Silicon Glen (the latter written by Craig Cockburn, a former member of our choir). There were three auld gypsies came to our hall door. They came brave and boldly-o. And the other sang a raggle taggle gypsy-o. "She's away with the raggle taggle gypsy-o"
It was there he espied his lady-o. "What makes you leave your house and land? What makes you leave your money-o? "O, what care I for my house and my land? What care I for money, O? I'm away with the raggle taggle gypsy-o"
With the sheet turned down so bravely-o! In the arms of the raggle taggle gypsy-o"
With the sheet turned down so bravely, O? You rode high and I rode low. Than all of your cash and money-o"
She’s away with the raggle taggle gypsy-o! The always-reliable Mainly Norfolk site has a good page of information, links, videos and lyrics on this song and its variants. If you want to delve deep into email discussion and information threads, there is much on this song and its variants in the Mudcat folk lyric and knowledge site. There is also a Wikipedia page. The lyrics for King of Birds (and Karine's original version of the song) can be found here on her own website. Sumer is icumen in, lude sing cucu. Groweth sede and bloweth mead and springs the wood anew. Bullock starteth, buck now verteth, Merrye sing cucu. Cucu, cucu, well singest thou cucu, nor swick tha naver now. The lyrics for Roseville Fair, and more information on the song, including a video of Bill Staines performing it himself, can be found on Mainly Norfolk. The lyrics for Raise Your Voice can be found here on Melrose Quartet's website. And here is an official Youtube video of Melrose Quartet singing it. Now it's ten years later and we're in this hall. In friendship and in song - loud and proud, wrong and strong. So join us in our singing, one and all. St Giles Bowl is the title track on Tim Jones & The Dark Lanterns' debut album. The lyrics (and guitar chords) for St Giles Bowl can be found here on their website. What care we how white the Minch is? Gazing seaward from the heather. me lips would grow all mouldy. Saint Patrick was a gentleman. He came from decent people. well roll me in the clover. Here is an official Youtube video of The Decemberists' own version of Eli, The Barrow Boy. On the Leeds and Selby railway. I said my prayers to stay alive. And working on the railway. I landed at St Peter's Gate. Won't you give us a penny for to bury the wren? And we won't be comin' back for another whole year! For me poor dry throat and I'll sing like a linnet! And then we'll all be goin' on our way! The Chieftains' version is on their Christmas album, The Bells of Dublin: this seems to be an official posting of their version on Youtube. And here's a Wikipedia article on Wren Day. Whack for the riddle to me roo dum dar. Than the King of Spain and his whole Navy. They were both shot away by a cannonball. We know this song from the version by Tim Hart and Maddy Prior on their album Folk Songs of Old England Vol. 2. Here's the Mainly Norfolk page on the song. We recorded our version of My Son John in summer 2015 as part of Deutscher Chor London's traditional song CD project. Our thanks to them for that opportunity, and this recording. That album, Der Mond ist aufgegangen, is available to buy on the Deutscher Chor London's website.